The HAL Tejas is an Indian single-engine, delta wing, multirole light fighter designed by the Aeronautical Development Agency (ADA) and Hindustan Aeronautics Limited (HAL) for the Indian Air Force and Indian Navy. It came from the Light Combat Aircraft (LCA) programme, which began in the 1980s to replace India's ageing MiG-21 fighters. 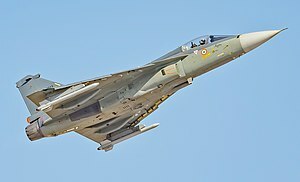 In 2003, the LCA was officially named "Tejas". The Tejas is the second supersonic fighter developed by Hindustan Aeronautics Limited (HAL) after the HAL HF-24 Marut. As of 2016 the Tejas Mark 1 is in production for the Indian Air Force (IAF) and the naval version is undergoing flight tests for Indian Navy (IN). The projected requirement for the IAF is 200 single-seat fighters and 20 twin-seat trainers, while the IN expects to operate 40 single-seat fighters. The first Tejas IAF unit, No. 45 Squadron IAF Flying Daggers was formed on 1 July 2016 with two aircraft. Initially stationed at Bangalore, 45 Squadron was later relocated to its home base at Sulur, Tamil Nadu. The Minister of State for Defence, Subhash Bhamre, reported to parliament that the indigenous content of the Tejas is 59.7% by value and 75.5% by number of line replaceable units. In 1969, the Indian government accepted the recommendation by its Aeronautics Committee that Hindustan Aeronautics Limited (HAL) should design and develop a fighter aircraft around a proven engine. Based on a 'Tactical Air Support Aircraft' ASR markedly similar to that for the Marut, HAL completed design studies in 1975, but the project fell through due to inability to procure the selected "proven engine" from a foreign manufacturer and the IAF's requirement for an air superiority fighter with secondary air support and interdiction capability remained unfulfilled. In 1983, IAF realised the need for an Indian combat aircraft for two primary purposes. The principal and most obvious goal was to replace India's ageing MiG-21 fighters, which had been the mainstay of the IAF since the 1970s. The "Long Term Re-Equipment Plan 1981" noted that the MiG-21s would be approaching the end of their service lives by the mid-1990s, and that by 1995, the IAF would lack 40 percent of the aircraft needed to fill its projected force structure requirements. The LCA programme's other main objective was an across-the-board advancement of India's domestic aerospace industry. The value of the aerospace "self-reliance" initiative is not simply the aircraft's production, but also the building of a local industry capable of creating state-of-the-art products with commercial spin-offs for a global market. In 1984, the Indian government chose to establish the Aeronautical Development Agency (ADA) to manage the LCA programme. While the Tejas is often described as a product of Hindustan Aeronautics Limited (HAL), responsibility for its development belongs to ADA, a national consortium of over 100 defence laboratories, industrial organisations, and academic institutions with HAL being the principal contractor. The government's "self-reliance" goals for the LCA included the three most sophisticated and challenging systems: the fly-by-wire (FBW) flight control system (FCS), multi-mode pulse-doppler radar, and afterburning turbofan engine. The IAF's Air Staff Requirement for the LCA were not finalised until October 1985. This delay rendered moot the original schedule which called for first flight in April 1990 and service entry in 1995; however, it also gave the ADA time to better marshal national R&D and industrial resources, recruit personnel, create infrastructure, and to gain a clearer perspective of which advanced technologies could be developed locally and which would need to be imported. Project definition commenced in October 1987 with France's Dassault-Breguet Aviation as consultants. Dassault-Breguet were to assist in the design and systems integration of the aircraft, with 30 top-flight engineers reported to have flown to India to act as technical advisers to IADA, in exchange for $100m / ₹560 crore (equivalent to ₹52 billion or US$730 million in 2018), this phase was completed in September 1988. A review committee was formed in May 1989, which reported that infrastructure, facilities and technologies in India had advanced sufficiently in most areas and that the project could be undertaken. A two-stage full-scale engineering development (FSED) process was opted for. In 1990, the design was finalised using the "control configured vehicle" concept to define a small tailless delta winged aircraft with relaxed static stability (RSS) for enhanced manoeuvrability. Phase 1 commenced in April 1993, and focused on "proof of concept" and comprised the design development and testing (DDT) of two technology demonstrator aircraft which were named as TD-1 and TD-2. This would be followed by the production of two prototype vehicles (PV-1 and PV-2), TD-1 finally flew on 4 January 2001. FSED Programme Phase-I was successfully completed in March 2004 and cost ₹2,188 crore. The relaxed static stability (RSS) was an ambitious requirement. In 1988, Dassault had offered an analogue flight control system (FCS), but the ADA recognised that digital FCSs would supplant it. First flying in 1974, the General Dynamics F-16 was the first production aircraft designed to be slightly aerodynamically unstable to improve manoeuvrability. In 1992, the LCA National Control Law (CLAW) team was set up by the National Aeronautics Laboratory to develop India's own state of the art fly-by-wire FCS for the Tejas. In 1998, Lockheed Martin's involvement was terminated due to a US embargo in response to India's second nuclear tests in May of that year. Another critical technology is the multi-mode radar (MMR). The Ericsson/Ferranti PS-05/A I/J-band multi-function radar was initially intended to be used, as used on Saab's JAS 39 Gripen. However, after examining other radars in the early 1990s, the Defence Research and Development Organisation (DRDO) became confident that local development was possible. HAL's Hyderabad division and the Electronics and Radar Development Establishment (LRDE) were selected to jointly lead the MMR programme, and work commenced in 1997. The DRDO's Centre for Airborne System (CABS) is responsible for the MMR's test programme. Between 1996 and 1997, CABS converted the surviving HAL/HS-748M Airborne Surveillance Post (ASP) into a testbed for the LCA's avionics and radar. The NAL's CLAW team completed integration of the flight control laws by themselves, with the FCS software performing flawlessly for over 50 hours of pilot testing on TD-1, resulting in the aircraft being cleared for flight in January 2001. The automatic flight control system (AFCS) has been praised by all test pilots, one of whom remarked that he found the LCA easier to control during take-off than a Mirage 2000. Phase 2 commenced in November 2001, and consisted of the manufacturing of three more prototype vehicles (PV-3, PV-4 and PV-5), leading to the development of the final variant that would join the air force and the navy and 8 Limited Series Production (LSP) aircraft, and establishment of infrastructure for producing 8 aircraft per year. The phase cost ₹3,301.78 crore, and an additional amount of ₹2,475.78 crore was given for induction into Indian Air Force by obtaining IOC and FOC. The total cost for development of Tejas (including PDP, Phase 1 and Phase 2) was ₹7,965.56 crore as of August 2013. By mid-2002, the MMR had reported suffered major delays and cost escalations. By early 2005, only the air-to-air look-up and look-down modes — two basic modes — were confirmed to have been successfully tested. In May 2006, it was revealed that the performance of several modes being tested "fell short of expectations." As a result, the ADA was reduced to running weaponisation tests with a weapon delivery pod, which is not a primary sensor, leaving critical tests on hold. According to test reports, there was a serious compatibility issue between the radar and the LRDE's advanced signal processor module (SPM). Acquisition of an "off-the-shelf" foreign radar is an interim option being considered. Of the five critical technologies the ADA identified at the beginning of the programme as required to design and build a new fighter, two have been successful: the development and manufacture of carbon-fibre composite (CFC) structures and skins, and a modern glass cockpit. ADA has a profitable commercial spin-off in its Autolay integrated automated software for designing 3-D laminated composite elements (which has been licensed to both Airbus and Infosys). By 2008, 70% of the LCA's components were being manufactured in India, the dependence on imported components was stated to be progressively reduced over time. However, problems were encountered with the other three key technology initiatives. For example, the intended engine, the GTRE GTX-35VS Kaveri, had to be replaced with an off-the-shelf "foreign" engine, the General Electric F404. Kota Harinarayana was the original Programme Director and Chief Designer for the Tejas Programme. In March 2005, the IAF placed an order for 20 aircraft, with a similar purchase of another 20 aircraft to follow. All 40 were to be equipped with the F404-GE-IN20 engine. In December 2006, a 14-member "LCA Induction Team" was formed at Bangalore to prepare the Tejas and assist with its introduction into service. On 25 April 2007, the first Limited Series Production (LSP-1) Tejas performed its maiden flight, achieving a speed of Mach 1.1 (1,347.5 km/h; 837.3 mph). The Tejas completed 1,000 test flights and over 530 hours of flight testing by 22 January 2009. In 2009, a Tejas achieved a speed of over 1,350 kilometres per hour (840 mph) during sea level flight trials at INS Hansa, Goa. On 16 June 2008 LSP-2 made its first flight followed by the first flight of the trainer variant in November 2009. On 23 April 2010, LSP-3 flew with a hybrid version of the Elta EL/M-2032 multi-mode radar; in June 2010, LSP-4 made its maiden flight in an IAF Initial Operating Clearance (IOC) configuration. By June 2010, the Tejas had completed the second phase of hot weather trials in an IOC configuration with the weapons system and sensors integrated. Sea trials were also being carried out. On 19 November 2010, LSP-5 with IOC standard equipment started flight trials. In December 2009, the government sanctioned ₹8,000 crore to begin production of the fighter for the Indian Air Force and Indian Navy. The Indian Navy has a requirement for 50 Tejas aircraft and the first prototype, NP-1 was rolled out in July 2010. IAF ordered 20 additional Tejas fighters after the defence acquisition council cleared the plan. In December 2014 the LCA Navy successfully conducted ski-jump trials at SBTF Goa. The navy variant has a special flight control law mode. It controls a hands-free take-off, which reduces the pilot workload, as the ramp launches the aircraft on an upward flight path. In November 2010, it was reported that the Tejas Mk 1 reportedly fell short of the relaxed Air Staff Requirements stipulated for limited series production (LSP) aircraft. The areas that did not meet requirements were power to weight ratio, sustained turning rate, maximum speeds at low altitudes, AoA range, and weapon delivery profiles; the extent of the deficiencies was classified. On 9 March 2012, LSP-7 took to its maiden flight from HAL airport. The Naval LCA made its first flight, almost two years after being rolled out, on 27 April 2012. In September 2011, weapons tests, including bombing trials, began at Pokhran range, to be followed by missile trials at Goa. On 27 June 2012, three Tejas (LSP 2, 3 and 5) aircraft completed bombing runs in the desert of Rajasthan, using precision laser-guided 1,000 lb bombs and unguided bombs. The Tejas had completed 1,941 flights by July 2012. In the later half of 2012, the Tejas was grounded for over three months due to a serious safety issue which arose with the introduction of a new pilots' helmet, which protruded above the ejection seat. There was concern that, during an ejection, the helmet would strike the canopy before the canopy was released. Flight tests resumed in November 2012 after the ejection system had been modified. LSP 8 had a successful maiden test flight on 31 March 2013, and the programme had completed 2,418 test flights by 27 November 2013. On 31 March 2013, LSP-8 took to its maiden flight from HAL airport. On 8 November 2014, PV-6(KH-T2010), a trainer variant, completed its first test flight. Out of a total of 35 major avionics components and line-replaceable units (LRUs), only three involve foreign systems. These are the multi-function displays (MFDs) by Sextant (France) and Elbit (Israel), the helmet-mounted display and sight (HMDS) cueing system by Elbit, and the laser pod supplied by Rafael (Israel). Production aircraft are expected to have MFDs from Indian suppliers. A few important items of equipment (such as the Martin-Baker ejection seat) have been imported. As a consequence of the embargo imposed on India after its nuclear weapons tests in May 1998, many items originally planned to be imported were instead developed locally; these sanctions contributed to the prolonged delays suffered by the LCA. On 10 January 2011, IOC, allowing IAF pilots to fly the Tejas, was awarded by Defence Minister A K Antony to Chief of Air Staff Air Chief Marshal P V Naik. The IAF plans to raise the first squadron in Bangalore to iron out issues with ADA and HAL, and eventually base these fighters at Sulur Air Force Station, Coimbatore in the southern state of Tamil Nadu. Tejas' Final Operational Clearance (FOC) was repeatedly delayed since 2011 and was finally achieved on 20 February 2019. HAL was instructed by the Indian government to strictly adhere to deadlines to ensure Initial Operational Clearance-II by the end of 2013 and Final Operational Clearance (FOC) by the end of 2014. On 20 December 2013, the IOC-II was issued, after which the aircraft was cleared to be flown by regular IAF pilots and begin induction into squadron service. The first squadron of 18 to 20 Tejas will be based at Sulur Air Force Station, Coimbatore in the state of Tamil Nadu, and it will work to achieve FOC by December 2014. To fulfill the IOC-II standard, the aircraft was certified to carry close to three tons of weapons which include laser-guided 500 kg bombs and short-range R-73 missiles, reach top speeds of 1,350 km per hour, withstand turns up to 7 g, reach angle of attack of 24 degrees (from 17 degrees initially), and have an operational radius of 400–500 km. To obtain FOC, the fighter will have to be certified for six more criteria. Integration of Derby and Python BVR missiles weighing 150 kg, with a range of 70 km, as well as a Gryazev-Shipunov GSh-23 gun will be undertaken. An air-to-air refuelling probe supplied by Cobham will be added. The angle of attack will be increased from 24 to 28 degrees, the braking system will be enhanced, and the existing nose cone radome made of composites will be replaced by a quartz model in a bid to increase the current radar range of 45–50 km to more than 80 km. These modifications were expected to be completed within 15 months of IOC-II. In order to expand the flight envelope to meet service requirements, the programme enlisted assistance from EADS. The Final Operational Clearance (FOC) campaign began in December 2013, with three aircraft from Tejas flight-line successfully completing advanced weapon trials. The campaign was held in Jamnagar. New weapons were integrated on the aircraft. As part of the FOC, the aircraft is being readied for all-weather trials in Bangalore and in Gwalior. Tejas took its maiden flight in January 2001, and by December 2013, it had completed 2,587 sorties covering over 1,750 hours. In July 2014, the FOC was pushed back as six or more aircraft were needed for testing and only one had been produced then. Tejas received IOC-II clearance on 17 January 2015. In May 2015, the Mk 1 aircraft was criticized by the Comptroller and Auditor General of India (CAG) for not meeting IAF requirements, such as a lack of a two-seat trainer, electronic warfare capabilities, the Radar Warning Receiver/Counter Measure Dispensing System, weight increases, reduced internal fuel capacity, non-compliance of fuel system protection, forward-facing pilot protection, and reduced speed. Most of these issues are expected to be rectified in the future Mk 2 version. In October 2015, IAF Air Chief Marshal Arup Raha confirmed that the air force had ordered 120 (six squadrons) of Tejas Mk 1A, triple the 40 aircraft it had previously committed to buying. It was reported that IAF agreed to accept 40 aircraft even though the CAG had found serious operational shortfalls, including engine thrust, weight and pilot protection in front against 7.62 mm rifle calibre rounds. The IAF agreed to accept the initial Tejas aircraft with some deficiencies to keep the programme going; the DRDO and HAL promised an improved Tejas Mk 1A version; changes to the ballast and landing gear will reduce its weight by 1,000 kg and the delivery will begin by 2016. Tejas Mk 1A shall also have electronic warfare equipment, better air to air capability, aerial refueling and improved ease of maintenance. In February 2016, LSP-7 test-fired the BVRAAM Derby missile on a BNG (Ballistic Non Guided) mode in Jamnagar as part of its scheduled weapon trials. These weapon trials are part of the Final Operational Clearance (FOC) mandate. It was the 169th flight of LSP-7 and was piloted by Group Capt Rangachari of National Flight Test Centre. The aircraft is also scheduled to fire a Close Combat Missile (CCM) Python-5 as part of the FOC trials. The LSP-7 along with LSP-4 were part of Indian flying assets at the Bahrain International Air Show (BIAS-2016). On 26 February 2016, Defence Minister Manohar Parrikar said in the Lok Sabha that the Indian Air Force will accept three to four Tejas this year and stand up a total of eight squadrons in eight years. He also said, "We are also in the process of approving the second line of manufacturing to the HAL so that they can produce 16 aircraft per year." On 7 November 2016, Parrikar approved procurement of 83 Tejas for the IAF, at a cost of ₹50,025 crore (US$7 billion). In December 2016, the Indian Navy announced that the fighter is overweight, and they will look for other alternatives. The Indian Navy eventually issued an RFI for 57 naval multirole fighters. On 12 May 2017, Tejas successfully demonstrated an Air-to-Air Beyond Visual Range (BVR) missile firing capability by releasing Derby Air-to-Air BVR missile in RADAR guided mode. The missile launch was performed in lock-on after launch mode. The missile destroyed its manoeuvrable aerial target with pinpoint precision at the Interim Test Range, Chandipur in Odisha. In November 2017, it was reported that the Indian Air Force told the government that the Tejas is inadequate for the single-engined fighter program with insufficient flight endurance, smaller payload capacity, increased maintenance hours, and higher costs for maintenance compared to other contender aircraft. HAL's chief rejected the criticisms and called the Tejas a world class fighter jet that can fill its defined role. He also mentioned that minimum life span of Tejas is 30 years which can be extended. HAL CMD T Suvarna Raju also stated that HAL delivered five Tejas as of 19 November 2017, which have made more than 600 flights. In February 2018, refuelling of Tejas with the engine running—known as "hot refuelling"—was carried out. Hot refuelling capability is one of the requirements for Tejas Mk 1A and is expected to shorten the turnaround time between sorties. In August 2018, the naval variant of the Tejas conducted its first "taxi-in" engagement on a naval platform in Goa to prove its hook-arrester system. The Indian Defence Minister, Nirmala Sitharaman's backing of the Tejas programme allowed the restarting of tests and gave its naval variant a fresh lease on life. In September 2018, Tejas successfully completed the trials for mid air refuelling, which is one of the key items required for the aircraft to obtain FOC. In January 2019, HAL received permission from CEMILAC to start production of FOC standard Tejas, despite the certification not being awarded yet. On 20 February 2019, during Aero India 2019, Final Operational Clearance was formally awarded to Tejas. The Tejas is a single-engine multirole fighter which features a tailless, compound delta wing and is designed with "relaxed static stability" for enhanced manoeuvrability. Originally intended to serve as an air superiority aircraft with a secondary ground-attack role, its flexibility permits a variety of guided air-to-surface and anti-shipping weapons to be integrated for multirole and multimission capabilities. The tailless, compound-delta planform is designed to be small and lightweight. This platform also minimises the control surfaces needed (no tailplanes or foreplanes, just a single vertical tailfin), permits carriage of a wider range of external stores, and confers better close-combat, high-speed, and high-alpha performance characteristics than comparable cruciform-wing designs. Extensive wind tunnel testing on scale models and complex computational fluid dynamics analyses have optimised the aerodynamic configuration for minimum supersonic drag, a low wing-loading, and high rates of roll and pitch. The maximum payload capability of Tejas is 4,000 kg (8,818 lb). All weapons are carried on one or more of seven hardpoints with total capacity of greater than 4,000 kg: three stations under each wing and one on the under-fuselage centreline. An eighth offset station beneath the port-side intake trunk can carry a variety of pods like FLIR, IRST, laser rangefinder/designator, as can the centreline under-fuselage station and inboard pairs of wing stations. Auxiliary fuel tanks of 800 and 1,200 litres can be carried under the fuselage to extend range. An aerial refuelling probe on the starboard side of the forward fuselage can further extend range and endurance. RAFAEL's Derby fire-and-forget missile will serve as the Tejas' initial medium range air-air armament. The Brahmos NG supersonic cruise missile is being developed for the Tejas. Stealth features have been designed into Tejas. Being small provides an inherent degree of visual stealth, the airframe's high usage of composites (which do not reflect radar waves), a Y-duct inlet which shields the engine compressor face from probing radar waves, and the application of radar-absorbent material (RAM) coatings are intended to minimise its susceptibility to detection and tracking. Tejas uses Martin-Baker 16LG zero-zero ejection seat. DRDO integrated an indigenous CSS, or canopy severance system, in the Tejas which allows the pilot to eject safely. Tejas is constructed of aluminium-lithium alloys, carbon-fibre composites, and titanium alloys. Composite materials make up 45% of the airframe by weight and 95% by surface area. Upper and lower wing skins are manufactured from a single piece of carbon-fibre reinforced polymer. Wing spars and ribs are also made out of carbon composites. The percentage of carbon composites in the airframe by weight rose from 30% in the technology demonstrators to 42% in the prototype vehicles. The construction of elevons, tailfin, rudder, air brakes and landing gear doors use co-cured and co-bonded manufacturing techniques. The radome is made out of Kevlar, while the fin tip is made out of glass-fibre reinforced plastic. Composite materials are used to make an aircraft lighter compared to an all-metal design, and the LCA's percentage employment of carbon-fibre composites is one of the highest among contemporary aircraft of its class. Apart from making the plane much lighter, there are also fewer joints or rivets, which increases the aircraft's reliability and lowers its susceptibility to structural fatigue cracks. The wing and fin of the compound-delta aircraft are of carbon-fibre-reinforced polymer, and were designed to provide a minimum weight structure and to serve as integral fuel tanks. The tailfin is a monolithic honeycomb structure piece, reducing the manufacturing cost by 80% compared to the "subtractive" or "deductive" method, involving the carving out of a block of titanium alloy by a computerised numerically controlled machine. No other manufacturer is known to have made fins out of a single piece. The use of composites resulted in a 40% reduction in the total number of parts, including half the number of fasteners required, compared to a metallic frame design. The composite design also helped to avoid about 2,000 holes being drilled into the airframe. Overall, the aircraft's weight is lowered by 21%. While each of these factors can reduce production costs, an additional benefit — and significant cost savings — is realised in the shorter time required to assemble the aircraft — seven months for the LCA as opposed to 11 months using an all-metal airframe. The wing-shielded, side-mounted air intakes are fixed-geometry with splitter plates. In 2001 it was envisaged that the naval variant would have nose droop to provide improved view for carrier landings, and wing leading–edge vortex controllers (LEVCON) to increase lift during approach. The LEVCONs are control surfaces that extend from the wing-root leading edge and thus afford better low-speed handling for the LCA, which would otherwise be compromised by the increased drag that results from its delta-wing design. The LEVCONs should also increase controllability at high angles of attack (AoA). The naval Tejas will also have a strengthened spine, a longer and stronger undercarriage, and powered nose wheel steering for deck manoeuvrability. The Tejas trainer variant will have "aerodynamic commonality" with the two-seat naval aircraft design. The Tejas has a night vision goggles (NVG)-compatible "glass cockpit", dominated by an CSIR-CSIO domestically-developed head-up display (HUD), three 5 in x 5 in multi-function displays, two Smart Standby Display Units (SSDU), and a "get-you-home" panel providing the pilot with essential flight information in case of an emergency. The displays provide information on key flight systems and controls on a need-to-know basis, along with basic flight and tactical data. The pilot interacts with onboard systems through a multifunctional keyboard and several selection panels. The CSIO-developed HUD, Elbit-furnished DASH helmet-mounted display and sight (HMDS), and hands-on-throttle-and-stick (HOTAS) controls reduce pilot workload and increase situation awareness by allowing access to navigation and weapon-aiming information with minimal need to spend time "head down" in the cockpit. The first 20 production Tejas Mk 1 equipped with hybrid version of the EL/M-2032 radar. It features look-up/look-down/shoot-down modes, low/medium/high pulse repetition frequencies (PRF), platform motion compensation, doppler beam-sharpening, moving target indication(MTI), Doppler filtering, constant false alarm rate (CFAR) detection, range-Doppler ambiguity resolution, scan conversion, and online diagnostics to identify faulty processor modules. The Tejas Mk 1A will be equipped with an improved version of the EL/M-2052 AESA radar being developed jointly by Elta and HAL. The electronic warfare suite is designed to enhance combat survivability during deep penetration. The EW suite is developed by the Defence Avionics Research Establishment (DARE) with support from the Defence Electronics Research Laboratory (DLRL). This EW suite, known as Mayavi, includes a radar warning receiver (RWR), Missile Approach Warning (MAW) and a Laser warning receiver (LWR) system, Infrared & Ultraviolet Missile warning sensors, self-protection jammer, chaff, jaff and flares dispenser, an electronic countermeasures (ECM) suite and a towed radar decoy (TRD). In the interim, the Indian Ministry of Defence has revealed that an unspecified number of EW suites had been purchased from Israel's Elisra for the LCA prototypes. Tejas is also to be equippable with an infra-red search and track (IRST) sensor, which can detect and track thermal energy emissions. This system shall be pod-based, additional sensor pods are to include drop tanks for ferry flight/extended range/loitering time, FLIR targeting pod, ECM pods, Flares/Infrared decoys dispenser pod and chaff pod, EO/IR sensor pod, LITENING targeting pods, forward looking infrared (FLIR) sensor, and a laser designator/laser rangefinder, which can be used in various capacities, including reconnaissance, training, or attack. Since the Tejas is a relaxed static stability design, it is equipped with a quadruplex digital fly-by-wire flight control system to ease pilot handling. The Tejas aerodynamic configuration is based on a pure delta-wing layout with shoulder-mounted wings. Its control surfaces are all hydraulically actuated. The wing's outer leading edge incorporates three-section slats, while the inboard sections have additional slats to generate vortex lift over the inner wing and high-energy air-flow along the tail fin to enhance high-AoA stability and prevent departure from controlled flight. The wing trailing edge is occupied by two-segment elevons to provide pitch and roll control. The only empennage-mounted control surfaces are the single-piece rudder and two airbrakes located in the upper rear part of the fuselage, one each on either side of the fin. Early on, it was decided to equip prototype aircraft with the General Electric F404-GE-F2J3 afterburning turbofan engine while a program to develop a domestic powerplant led by the Gas Turbine Research Establishment was launched. In 1998, after Indian nuclear tests, US sanctions blocked sales of the F404, leading to a greater emphasis on the domestic Kaveri. In 2004, General Electric was awarded a US$105 million contract for 17 uprated F404-GE-IN20 engines to power the eight pre-production LSP aircraft and two naval prototypes; deliveries began in 2006. In 2007, a follow-on order for 24 F404-IN20 engines to power the first operational Tejas squadron was issued. Cost overruns and delays were encountered in the Kaveri's development. In mid-2004, the Kaveri failed high-altitude tests in Russia, ruling out it powering the first production Tejas aircraft. [N 1] In February 2006, the ADA awarded a contract to French engine company Snecma for technical assistance on the Kaveri. Using Snecma's new core, an uprated derivative of the Dassault Rafale's M88-2 engine, providing 83–85 kilonewtons (kN) of maximum thrust was being considered by DRDO. The IAF objected that since Snecma already developed the core of the engine, the DRDO will not be participating in any joint development but merely providing Snecma with an 'Indian-made' stamp. In November 2014, the DRDO was submitting documents to cancel development of Kaveri. In 2008, it was announced that an in-production powerplant would have to be selected; this was required to be in the 95 to 100 kilonewton (kN) (21,000–23,000 lbf) range to execute combat manoeuvres with optimal weapons load. After evaluation and acceptance of technical offers for both the Eurojet EJ200 and the General Electric F414, the commercial quotes were compared in detail and GE's F414 was declared as the lowest bidder. The deal covered the purchase of 99 GE F414 engines, an initial batch will be supplied directly by GE and the remainder to be manufactured in India under a technology transfer arrangement. According to the IAF, adopting the new powerplant required a three-to-four years of redesign work. The formation of the first Tejas-equipped squadron started in July 2011. The Tejas entered service with No. 45 Squadron IAF (Flying Daggers) based at the Yelahanka Air Base at Bangalore on 1 July 2016 before being moved to Sulur Air Force Station in Coimbatore. The squadron will initially have four aircraft. The IAF's Aircraft & Systems Testing Establishment will receive four aircraft already built including two development aircraft. In June 2017, Hindustan Aeronautics stated that it expects to have delivered 123 Tejas aircraft to the Indian Air Force by 2024–25. HAL outlined a three–pronged approach to accelerate aircraft production. It will build an additional assembly line, reuse the Hawk assembly line, and outsource major components to the private sector. The Tejas made its international debut on 21 January 2016, when two aircraft flew in the Bahrain International Air Show. On 21 November 2016, the Indian Ministry of Defence said that they're proposing to have the Tejas exported with preliminary talks taking place with some friendly countries. The jet has solicited interest with the UAE with some discussions made during a visit by UAE Minister of State and Defence Mohammed Ahmed Al Bowardi Al Falacy during a state visit in October 2018 as part of growing defence relations between India and the UAE. In January 2019, the Royal Malaysian Air Force issued a request for information to HAL regarding the Tejas for their light combat aircraft requirement. Aircraft already built and projected models to be built. Model designations, tail numbers and dates of first flight are shown. PV-3 (KH2005) – 1 December 2006. PV-6 (KH-T2010) – 8 November 2014 – Fighter/Trainer Variant. NP-1 (KH-T3001) – Two-seat Naval variant for carrier operations. Rolled out in July 2010. NP-1 made its first flight on 27 April 2012. NP-2 (KH3002) – First flight on 7 February 2015 with ski-jump take-off and arrested landing required in STOBAR carrier. LSP-1 (KH2011) – 25 April 2007. This LCA is powered by F404-F2J3 Engine. LSP-2 (KH2012) – 16 June 2008. This is the first LCA fitted with F404-IN20 engine. LSP-3 (KH2013) – 23 April 2010. The first aircraft to have the Hybrid MMR radar and will be close to the IOC standard. LSP-4 (KH2014) – 2 June 2010. The first aircraft that was flown in the configuration that will be delivered to the Indian Air Force. In addition to the Hybrid MMR, the aircraft flew with a Countermeasure Dispensing System and an identify friend or foe electronic system. LSP-5 (KH2015) – 19 November 2010. IOC standard, with all sensors including night lighting in the cockpit, and an auto-pilot. LSP-7 (KH2017) – 9 March 2012. APU intake has been aerodynamically reshaped. LSP-8 (KH2018) – First flight trial completed in March 2013. LSP 8 is the version that will go for production. Tejas Mk 1 - Single-seat operational variant for Indian Air Force. Tejas Trainer - Two-seat operational conversion trainer for the Indian Air Force. Tejas Mk 1A - IAF had initially ruled out further acquisition of Tejas Mk 1 until Mk 2 was ready. In 2015, HAL proposed Tejas Mk 1A as a stop-gap to keep production running as Mk 2 was delayed. It was to include an AESA radar, air-to-air refuelling capability, an external ECM pod and improvements for easier maintenance. Following an approval from Defence Acquisition Council for 83 Tejas Mk 1A, HAL invited global bids for AESA radar and ECM pods in December 2016. In December 2018, it was reported that HAL had selected Elta's EL/M-2052 AESA radar and EL/L-8222 ECM pod. On 20 December 2017, IAF initiated a tender to buy 83 Mk 1A worth 33,200 crore from HAL. However, with HAL quoting a price substantially higher than the Mk 1, the Defence Minister Nirmala Sitharaman announced in July 2018 that a committee to look into the cost of the Mk 1A, along with other products manufactured by defence Public Sector Undertakings. The committee, headed by the Defence Ministry’s Director of Costs, has been given 60 days time to review the cost of the Mk 1A. Tejas Mk 1 Navy - Single seat prototypes (NP1 & NP2) powered by F404 engines are used for the initial testing. The Naval variant of Tejas successfully completed testing in Goa during which the short take off (200 meter) from Shore Based Test Facility were carried out along with hot refueling. The flight test from aircraft carrier is scheduled for 2017. In December 2016, the navy stated that the aircraft is overweight for carrier operations. Tejas Trainer IN - Two-seat operational conversion trainer for the Indian Navy. Tejas Mk 2 Navy - Twin and single-seat carrier-capable variants for the Indian Navy. It will be equipped for carrier operation with ski-jump take-off and arrested landing. It will include strengthened airframe and telescopic landing gear. Tejas Mk 2 - The Tejas Mk 2, also called "Medium Weight Fighter", is to feature the more powerful General Electric F414-GE-INS6 engine with 98 kN of thrust. In November 2009, Ministry of Defence sanctioned ₹2,431.55 crore (equivalent to ₹46 billion or US$640 million in 2018) for development of Tejas Mk 2, which was expected to be completed by 2018. However, a delay in procurement of engines pushed back the initiation of development till 2013. As of 2018[update], the project is expected to be completed by 2022. Mk 2 will feature an AESA radar, an on-board oxygen generation system, and a built-in electronic warfare suite among other improvements to avionics. In January 2019, Air Chief Marshal Birender Singh Dhanoa said that the IAF has committed to procure twelve squadrons of Tejas Mk 2 aircraft. In Aero India 2019, a model of Tejas Mk 2 with close-coupled canards was displayed. Mk 2 will be slightly larger with a length of 14.6 m (48 ft) and a wingspan of 8.5 m (28 ft). An increase in payload capacity to 6,500 kg (14,300 lb) will allow it to carry more weapons. It will include an infra-red search and track system and a missile approach warning system. Indian Air Force – 40 Tejas Mk 1 ordered, including 16 single-seat aircraft in IOC configuration, a further 16 in FOC configuration and eight twin-seat trainers. IAF has initiated procurement of a further 73 single-seat fighters in Mk 1A configuration and 10 twin-seat trainers with a request for proposal issued to HAL in December 2017. Tejas carrying R-73 missile and drop tank. Astra missile displayed on stand. ^ Since India did not possess suitable aircraft, the high-altitude testing of the Kaveri was contracted to Russia, which used a Tu-16 bomber for the purpose. Another Kaveri engine was delivered to Russia for further flight testing from June to September 2006, this was tested on an Il-76 testbed instead of a Tu-16. ^ PTI (17 January 2015). "After 32 years, India finally gets LCA Tejas aircraft". Economic Times. Archived from the original on 29 March 2017. Retrieved 17 January 2015. ^ "Tejas: IAF inducts HAL's 'Made in India' Light Combat Aircraft – 10 special facts about the LCA". financialexpress.com. Archived from the original on 16 August 2016. Retrieved 1 July 2016. ^ "First Flights – Tejas – India's Light Combat Aircraft". tejas.gov.in. Archived from the original on 15 December 2017. Retrieved 24 March 2018. ^ Mathews, Neelam (11 March 2019). "HAL Ramps Up LCA Production and Looks to the Mk2". AINonline. ^ "EXCLUSIVE: With only two planes and issues unresolved, IAF to bring LCA Tejas home". India Today. Archived from the original on 29 June 2016. Retrieved 1 July 2016. ^ Shukla, Ajai (11 January 2014). "HAL pegs price of Tejas fighter at Rs 162 crore". Business Standard. ^ "Tejas price comes under scrutiny". The Hindu. 14 July 2018. ^ "LCA first prototype vehicle to fly next month". 21 August 2003. Archived from the original on 27 September 2011. Retrieved 30 June 2014. ^ "Compund Delta Wing - Technology - Tejas - India's Light Combat Aircraft". www.tejas.gov.in. Retrieved 25 February 2019. ^ a b "Light Combat Aircraft (LCA)". defencejournal.com. Archived from the original on 1 July 2014. Retrieved 1 July 2014. ^ "Republic Day Parade 2014 – A Curtain Raiser". Press Information Bureau. 25 January 2014. Archived from the original on 2 February 2014. Retrieved 27 January 2014. ^ a b "Tejas begins operations from Sulur station". The Times of India. The Times Group. 3 July 2018. ^ "Indigenous content of Tejas 59.7% by value & 75.5% by numbers". indianexpress.com. 18 November 2016. Archived from the original on 9 December 2017. Retrieved 9 December 2017. ^ a b c "The Light Combat Aircraft Story by Air Marshal MSD Wollen". Archived from the original on 17 October 2013. Retrieved 9 December 2013. First published in Indian Aviation, Opening Show report, Aero India 2001. ^ "Remembrance of Aeronautical Matters Past." Vayu Aerospace & Defence Review, 2004. Retrieved 7 March 2009. ^ "Light Combat Aircraft (LCA) Test-Flown Successfully." DRDO, January 2001. Retrieved 29 May 2012. ^ a b c Reddy, C. Manmohan. "LCA economics." The Hindu, 16 September 2002. Retrieved 29 May 2012. ^ a b c d e f g h i j "LCA Tejas History". Tejas.gov.in. Archived from the original on 17 October 2013. Retrieved 9 December 2013. ^ "Dassault wins Indian LCA contract". Flight International. London: Reed Business Information. 24 October 1987. Archived from the original on 22 December 2017. ^ a b c d e "LCA Tejas History: Genesis". tejas.gov.in. Archived from the original on 1 July 2014. Retrieved 1 July 2014. ^ "India's Light Combat Aircraft" (PDF). employmentnews.gov.in. Archived from the original (PDF) on 1 July 2014. Retrieved 1 July 2014. ^ Frawley 2002, p. 114. ^ "ADFCS-II". transport-research.info. Archived from the original on 14 July 2014. Retrieved July 6, 2014. ^ "20th Anniversary Celebrations of the National Control Law Team". nal.res.in. 10 June 2012. Archived from the original on 1 July 2014. ^ a b c "Tejas LCA: Light Multi-Role Fighter". aerospaceweb.org. Archived from the original on 5 April 2016. Retrieved 1 July 2014. ^ "Tejas / Light Combat Aircraft (LCA)". fighter-planes.com. Archived from the original on 6 July 2014. Retrieved July 6, 2014. ^ Taylor, Munson & Taylor 1989, p. 104. ^ Sharma, Ravi. "The LCA puzzle." Frontline, 16–29 July 2005. Retrieved 30 May 2012. ^ The Westinghouse — now Northrop Grumman — AN/APG-66, which is carried on the F-16, was among the radars evaluated by the ADA in 1992. ^ "India's flying Testbeds". B Harry. acig.org. 12 September 2005. Archived from the original on 1 July 2014. Retrieved 1 July 2014. ^ "Interview with Mr. Shyam Shetty, head of the National Control Law team: NAL and LCA-1: Flight Control Laws." National Aerospace Laboratories (NAL) Information Pasteboard, 25 June – 1 July 2001. ^ "AESA Programme For Tejas Scans For Development Partner". indian-military.org. Archived from the original on 13 March 2012. Retrieved 30 June 2014. ^ "Zephyr 2009 – Celebrating the Spirit of Aviation – Aerospace Engineering, IIT Bombay". aero.iitb.ac.in. Archived from the original on 3 September 2011. Retrieved 30 May 2011. ^ "Times of India: HAL Tejas supersonic fighter jets inducted into Indian Air Force". Archived from the original on 1 July 2016. ^ Ravi Sharma (3 December 2006). "IAF team to oversee LCA induction and operation". The Hindu. Archived from the original on 6 July 2014. Retrieved July 6, 2014. ^ "HAL Tejas". India TV News. 8 October 2013. Archived from the original on 14 July 2014. ^ "Tejas Trainer makes successful maiden flight" (PDF). Aeronautical Development Agency. Archived from the original (PDF) on 13 May 2014. Retrieved 6 July 2014. ^ a b "LCA Set To Fly With Israeli Radar". 22 April 2010. Archived from the original on 10 May 2011. Retrieved 30 June 2014. ^ "Indian LCA Undergoing Sea Trials". Aviation Week & Space Technology. Archived from the original on 10 May 2011. Retrieved 30 June 2014. ^ "Air force to get 20 more Tejas fighter aircraft, says Antony". livemint.com. 7 July 2010. Archived from the original on 10 May 2011. Retrieved 30 June 2014. ^ "LCA Navy all set for ski-jump trials at SBTF Goa". 8 December 2014. Archived from the original on 8 December 2014. ^ "Print Release". Archived from the original on 26 December 2014. ^ "LCA Tejas". sawfnews.com. Archived from the original on 30 November 2011. Retrieved 30 June 2014. ^ a b "Flight Test News". Aeronautical Development Agency. Archived from the original on 19 October 2013. Retrieved 30 June 2014. ^ "India's Light Combat Aircraft Tejas Completes 2,400 Sorties". 12 December 2013. Archived from the original on 24 December 2013. ^ a b "HAL successfully tested LCA Tejas PV-6". defenceradar.com. 8 November 2014. Archived from the original on 8 November 2014. ^ a b c "Light Combat Aircraft-Tejas Testing". Frontier India. 24 August 2007. Archived from the original on 20 December 2015. Retrieved 10 December 2013. ^ a b c d "LCA Tejas: An Indian Fighter – With Foreign Help". Defense Industry Daily. 13 August 2013. Archived from the original on 11 September 2013. Retrieved 30 June 2014. ^ M, By Anantha Krishnan. "Tejas inches closer to FOC; crucial trials coming up". Mathrubhumi. Archived from the original on 8 March 2017. Retrieved 7 March 2017. ^ a b c Krishnan, Anantha, M (20 February 2019). "Tejas officially given Final Operational Clearance". OnManorama. ^ "LCA Project". Press Information Bureau, Government of India. 5 August 2013. Archived from the original on 29 November 2014. Retrieved July 6, 2014. ^ "Air Chief NAK Browne reviews proposed first base for Tejas LCA". The Economic Times. 18 December 2013. Archived from the original on 6 July 2014. Retrieved 19 December 2013. ^ a b "Tejas LCA sprints towards IAF's frontline squadron". Business Standard. 9 December 2013. Archived from the original on 13 December 2013. Retrieved 10 December 2013. ^ "30 years in the making, Tejas aircraft finally gets initial operational clearance". The Times of India. 20 December 2013. Archived from the original on 21 December 2013. Retrieved 20 December 2013. ^ "Tejas Fires Missile, Clears Final Test; Big Step in Bangalore on December 20". The New Indian Express. 8 December 2013. Archived from the original on 23 December 2013. Retrieved 20 December 2013. ^ a b "Tejas all set to get certification for IAF induction". The Hindu. 19 December 2013. Archived from the original on 20 December 2013. Retrieved 20 December 2013. ^ "Key test for indigenous light combat aircraft Tejas today". The Times of India. 20 December 2013. Archived from the original on 8 January 2016. Retrieved 20 December 2013. ^ "Tejas Needs to Cross 6 Milestones in 15 Months". The New Indian Express. 19 December 2013. Archived from the original on 23 December 2013. Retrieved 19 December 2013. ^ "Failure of Indian LCA Tejas". Daily Mail. 1 December 2010. Archived from the original on 2 June 2012. Retrieved 30 June 2014. ^ a b "Advanced Weapon Trials of Tejas Fighter Completed". New Indian Express. 29 May 2014. Archived from the original on 30 June 2014. Retrieved 30 June 2014. ^ RAGHUVANSHI, VIVEK (20 July 2014). "India's 20-Year Late LCA Faces Fresh Delays". defensenews.com. Gannett Government Media. Archived from the original on 5 April 2016. Retrieved 20 July 2014. ^ Peri, Dinakar (31 July 2018). "'LCA clearance may take time'". The Hindu. ^ "Government Auditor Faults Tejas Light Combat Aircraft Project, Says it Fails to Meet Air Force's Needs". NDTV.com. 8 May 2015. Archived from the original on 12 May 2015. Retrieved 13 May 2015. ^ Sen, Sudhi Ranjan (30 September 2015). "Despite Flaws, India to Induct Tejas Mark 1-A Fighter Aircraft". ndtv.com. NDTV Convergence Limited. Archived from the original on 1 October 2015. ^ Franz, Stefan Gady (6 October 2015). "India's Air Force Will Field 42 Combat Squadrons by 2027". Diplomat. Archived from the original on 8 October 2015. ^ Shukla, Ajai (5 October 2015). "Indian Air Force chief expects full strength of 42 squadrons by 2027". Archived from the original on 6 October 2015. ^ "Performace Audit on Design, Development, Manufacture and Induction of Light Combat Aircraft of Union Government, Defence Services - Air Force" (PDF). May 2015. ^ "Tejas fires Derby missile in Jamnagar". www.oneindia.com. Archived from the original on 6 February 2016. Retrieved 6 February 2016. ^ "IAF to induct 8 squadrons 'Tejas' in 8 years: Manohar Parrikar". The Economic Times. 26 February 2016. Archived from the original on 9 March 2016. Retrieved 28 February 2016. ^ Menon, Jay (8 November 2016). "Indian Air Force To Get 83 Tejas Mk. 1-A Light Combat Aircraft". Aviation Week. Archived from the original on 6 March 2017. Retrieved 5 March 2017. ^ "Navy rejects Tejas, says 'overweight' fighter does not meet its requirements". indiatimes.com. Archived from the original on 6 December 2016. Retrieved 27 January 2017. ^ "Indian Navy rejects naval version of Tejas LCA, seeks alternative – IHS Jane's 360". janes.com. Archived from the original on 20 December 2016. Retrieved 27 January 2017. ^ "India seeks new naval fighter to replace rejected Tejas LCA". IHS Jane's 360. 26 January 2017. Archived from the original on 24 February 2017. Retrieved 23 February 2017. ^ "India's Tejas aircraft conducts test-firing of Derby air-to-air BVR missile". airforce-technology.com. Archived from the original on 16 May 2017. Retrieved 15 May 2017. ^ "Tejas successfully test-fires derby air-to-air beyond visual range missile". intoday.in. Archived from the original on 17 May 2017. Retrieved 15 May 2017. ^ Sudhi Ranjan Sen. "Tejas far behind competitors, not enough to protect Indian skies: IAF" Archived 11 November 2017 at the Wayback Machine. India Today, 10 November 2017. ^ "Tejas world-class fighter jet, plays defined role: HAL chief". indianexpress.com. 19 November 2017. Archived from the original on 1 December 2017. Retrieved 9 December 2017. ^ "Interview with HAL CMD: 'No frozen standard of preparation of LCA… that's where delays are coming'". indianexpress.com. 19 November 2017. Archived from the original on 1 December 2017. Retrieved 9 December 2017. ^ "'Hot refueling' trial of LCA Tejas successful - Times of India". The Times of India. Archived from the original on 28 February 2018. Retrieved 28 February 2018. ^ Som, Vishnu (2 August 2018). "Back From Dead: Navy's Tejas Fighter Preps For Tests On Aircraft Carrier". NDTV. Retrieved 2 March 2019. ^ "Naval version of Tejas undergoes successful tests". The Economic Times. 2 August 2018. Retrieved 2 March 2019. ^ "Tejas completes key midair refueling trial". The Times of India. Retrieved 15 September 2018. ^ "HAL gets nod to produce weaponised version of LCA Tejas". The Economic Times. Press Trust of India. 4 January 2019. ^ a b "LCA Tejas Technology – Compound Delta Wing". Tejas.gov.in. Archived from the original on 17 October 2013. Retrieved 9 December 2013. ^ "LCA and its Features". ada.gov.in. Archived from the original on 9 July 2010. Retrieved 30 June 2014. ^ "'LCA Tejas on a par with contemporaries'". Deccan Herald. Archived from the original on 27 August 2017. Retrieved 2 July 2016. ^ "Government open to making BrahMos-NG". sundayguardianlive.com. 21 May 2016. Archived from the original on 26 May 2016. Retrieved 1 July 2016. ^ "Advantage India: Why DRDO claims that LCA Tejas is the 'best in its class'". The Economic Times. 20 December 2013. Archived from the original on 5 April 2016. Retrieved 20 December 2013. ^ a b c "Tejas LCA exports likely after operational induction news". Domain-b. 10 January 2011. Archived from the original on 19 October 2013. Retrieved 10 December 2013. ^ a b c Jackson, Paul; Peacock, Lindsay; Bushell, Susan; Willis, David; Winchester, Jim, eds. (2016–2017). "India". IHS Jane's All the World's Aircraft: Development & Production. Couldson. pp. 302–303. ISBN 978-0710631770. ^ "Canopy Severance System- Canopy Severance System of Fighter Aircraft DRDO". drdo.gov.in. Archived from the original on 9 December 2017. Retrieved 16 December 2017. ^ Mathews, Neelam (17 July 2006). "Light Steps: India's LCA may be moving at a sedate pace, but it's progressing nonetheless". Aviation Week & Space Technology. Vol. 165 no. 3. New York. p. 126. ISSN 0005-2175. ^ Dreger, Paul (February 2004). "SE Asia Indigenous Fighter Programmes". Military Technology. Vol. 28 no. 2. Bonne. pp. 28–30. ISSN 0722-3226. ^ "LCA Tejas Technology – Composite Materials". Tejas.gov.in. Archived from the original on 17 October 2013. Retrieved 9 December 2013. ^ "Military Aircraft Directory Part 2". Flightglobal. 11 August 1999. Archived from the original on 12 December 2013. Retrieved 9 December 2013. ^ "Structure – Carbon Fibre Composite Wings". DRDO. Archived from the original on 12 December 2013. Retrieved 9 December 2013. ^ "Dreams lighten in LCA". Prakash, Sqn. Ldr. B.G. 16 February 2001. Archived from the original on 4 March 2008. Retrieved 30 June 2014. ^ "Aircraft: LCA". Space Transport. 19 August 2002. Archived from the original on 27 October 2009. Retrieved 6 July 2014. ^ Jebakumar, S.K. (March 2009). "Aircraft Performance Improvements – A Practical Approach" (PDF). DRDO Science Spectrum: 4–11. Archived (PDF) from the original on 28 December 2013. Retrieved 9 December 2013. ^ Ajai Shukla (25 October 2015). "Cutting-edge Israeli radar wins air force approval for Tejas fighter". business-standard.com. Archived from the original on 27 October 2015. Retrieved 28 October 2015. ^ "India orders over one hundred SIGMA 95 navigation systems from Sagem". Sagem. 19 February 2008. Archived from the original on 13 December 2013. Retrieved 10 December 2013. ^ Sharma, Rikeesh (January – March 2013). "Transformation of Indian Naval Aviation Post New Inductions" (PDF). Journal of Defence Studies, Institute for Defence Studies and Analyses. 7 (1): 42. ISSN 0976-1004. Archived (PDF) from the original on 13 December 2013. Retrieved 10 December 2013. ^ "Aircraft digital flight-control: Airplane cockpit control". aviationonline.info. 28 December 2013. Archived from the original on 1 July 2014. Retrieved 1 July 2014. ^ "Tejas – India's Light Combat Aircraft". Indiatimes. India Times. 25 July 2013. Archived from the original on 6 July 2014. Retrieved July 6, 2014. ^ a b "F404-GE-IN20 Engines Ordered for India Light Combat Aircraft". GE Aviation. 7 February 2007. Archived from the original on 6 July 2014. ^ a b "Fraud of Light Combat Aircraft – Tejas & Kaveris". Brig. (retd.) GB Reddi. manamlagaru.com. 23 January 2013. Archived from the original on 14 July 2014. Retrieved July 6, 2014. ^ Gunston, Bill (Ed.) (June 15, 2006). "GTRE Kaveri" in Jane's Aero-Engines, Issue 14. Coulsdon, Surrey, UK: Jane's Information Group Limited. ISBN 0-7106-1405-5. ^ Jackson, Munson & Peacock 2005, p. 195. ^ "Air Force says DRDO stalling Tejas fighter engine". Business Standard. 28 June 2010. Archived from the original on 14 July 2014. Retrieved 6 July 2014. ^ Raghuvanshi, Vivek. "Eurojet Bolsters Engine Offer for India's LCA." Archived 5 April 2016 at the Wayback MachineDefense News, 4 January 2010. Retrieved 29 May 2012. ^ "Defence Ministry plans to revive Tejas." Archived 14 May 2014 at the Wayback Machine Hindustan Times. Retrieved 30 May 2012. ^ "Squadron Formation Still a Distant Dream for Air Force". The New Indian Express. 20 December 2013. Archived from the original on 23 December 2013. Retrieved 20 December 2013. ^ Peri, Dinakar. "Air Force likely to get 123 LCA Tejas by 2024–25". The Hindu. Archived from the original on 19 March 2017. Retrieved 29 June 2017. ^ "Tejas is a pilot's delight". Bharat Shakti. Archived from the original on 25 January 2016. Retrieved 26 January 2016. ^ "Export of LCA Tejas". Press Information Bureau. 18 November 2016. ^ Gurung, Shaurya Karanbir (17 October 2018). "UAE 'interested' in HAL-made light combat aircraft Tejas". The Economic Times. ^ "Maiden flight by 2nd prototype of LCA Tejas' naval variant". The Economic Times. 7 February 2015. Archived from the original on 5 April 2016. Retrieved 7 February 2015. ^ a b "India flies another Tejas". Aviation Week & Space Technology. 19 June 2008. Archived from the original on 10 May 2011. Retrieved 30 June 2014. ^ "India To Fly Tejas LSP-5 Soon". Aviation Week & Space Technology. 1 November 2010. Archived from the original on 10 May 2011. Retrieved 30 June 2014. ^ ""Union Performance Defense Design Manufacture Light Combat Aircraft"" (PDF). cag.gov.in. Archived (PDF) from the original on 5 November 2016. Retrieved 15 May 2017. ^ Sharma, Ravi (5 December 2008). "IAF insists on changes to Tejas". The Hindu. ^ Shukla, Ajai (12 August 2015). "With Tejas Mark II years away, HAL asks air force to buy Tejas Mark 1-A". Business Standard. ^ Shukla, Ajai (27 October 2015). "IAF wants aerial refuelling, jammers, quick turnaround in new Tejas". Business Standard. ^ "Govt clears Rs 82,000 crore for new Tejas aircraft, choppers, Russian tanks". Deccan Chronicle. Press Trust of India. 8 November 2016. ^ Bedi, Rahul (20 December 2016). "India issues global tender for AESA radar and EW suites to equip Tejas LCA". IHS Jane's Defence Weekly. Archived from the original on 21 December 2016. ^ Bedi, Rahul (10 December 2018). "India selects IAI/Elta Systems radar and EW suite for Tejas LCA Mk 1A". Jane's Defence Weekly. Archived from the original on 10 December 2018. ^ Shukla, Ajai (21 December 2017). "Indian Air Force initiates Rs 33,000-cr buy of 83 Tejas fighters". Business Standard. ^ "Tejas' price can't come down". Bangalore Mirror. 17 July 2018. ^ Business Standard. "Naval Tejas successfully tested in Goa, will fly off aircraft carrier next year". business-standard.com. Archived from the original on 5 June 2016. Retrieved 11 May 2016. ^ "Navy rules out deploying 'overweight' Tejas on aircraft carriers". indianexpress.com. 2 December 2016. Archived from the original on 20 December 2016. Retrieved 27 January 2017. ^ Waldron, Greg (22 January 2013). "India to obtain 99 GE F414 engines for Tejas Mk II". Flightglobal.com. Archived from the original on 22 December 2017. ^ "F414 turbofan engines" (PDF). GE Aviation. Archived (PDF) from the original on 2 July 2017. ^ "Tejas Mk-II: India may avail consultancy from European manufacturers who bid for MMRCA deal". The Economic Times. Press Trust of India. 11 July 2018. ^ Peri, Dinakar (31 January 2019). "IAF chief flags delays in manufacture of equipment". The Hindu. ^ Tauro, Caron Natasha (20 February 2019). "Aero India 2019: ADA unveils Tejas AF Mk 2 Medium Weight Fighter". Jane's Defence Weekly. Bangalore. Archived from the original on 20 February 2019. ^ Dominguez, Gabriel (28 February 2018). "India's LCA Tejas demonstrates hot refuelling capability". IHS Jane's Defence Weekly. Archived from the original on 16 March 2018. ^ Krishnan, Anantha, M (23 June 2018). "IAF, HAL end impasse over Tejas trainers". OnManorama. ^ "DRDO TechFocus." Archived 22 March 2011 at the Wayback Machine DRDO, February 2011. Retrieved 10 December 2012. ^ "LCA Tejas Specifications – Powerplant". tejas.gov.in. Archived from the original on 17 October 2013. Retrieved 20 December 2013. ^ a b "PICTURES: India's Tejas receives initial operational clearance". FlightGlobal.com. 26 December 2013. Archived from the original on 13 November 2017. ^ a b c d e "Tejas Trials: Tejas Light Combat Aircraft Enters Key Test Phase". Aviation Week & Space Technology. Vol. 173 no. 17. New York: Informa. 11 April 2011. pp. 26–27. ISSN 0005-2175. ^ "BVR missile test-fired from Tejas". The Tribune. New Delhi. Press Trust of India. 28 April 2018. ^ a b Majumdar, Sayan (September – October 2014). "Tejas Redux: The Israeli Touch". Vayu Aerospace and Defence Review. No. 5. Society for Aerospace Studies. p. 82–84. ^ "Captive flight trials of anti-radiation missile soon". The Hindu. The Hindu Group. 17 February 2016. Archived from the original on 20 February 2016. Retrieved 18 February 2016. ^ a b "HAL to hike Tejas output as India approves order". Flight International. Vol. 190 no. 5563. London: Reed Business Information. 15–21 November 2016. p. 20. ISSN 0015-3710. ^ "LCA Tejas finally gets Radar!". Defence Aviation. 30 April 2010. Archived from the original on 5 April 2016. Retrieved 1 March 2016. Wikimedia Commons has media related to HAL Tejas.